The Intervention Partner is a small -group, short-term, supplementary intervention program that can help turn your struggling readers into successful, confident readers. 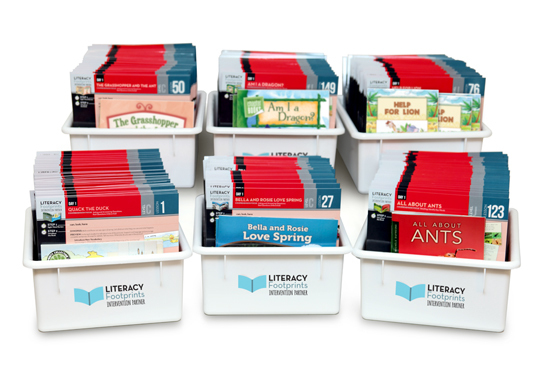 Each lesson provides teachers with engaging leveled books and systematic, fast-paced lessons plans that follow the Literacy Footprints framework. Set 1 is designed to work independently or in partnership with the Literacy Footprints Classroom Grade 1–3 classroom kits. At the heart of Literacy Footprints are high-quality leveled books that delight and engage readers. In Intervention Partner, students will encounter some of the same favorite characters such as Bella and Rosie, Jack and Daisy, Jasper the Cat, Clarence the Dragon, Little Dinosaur, Spaceboy, and more, along with familiar traditional tales, and nonfiction text that provides a gradual lift in complexity to support even the most reluctant reader. Each book has been precisely selected to correspond with a classroom book to support students in building a core of known high-frequency words. The same sight words are taught and practiced, and students have an opportunity to see the words they are learning in different contexts. Intervention Partner Lesson Word Study lessons have been designed to support and extend the same phonics concepts being taught in the matching Literacy Footprints Classroom classroom Lessonlesson. Struggling readers often become more confused when faced with conflicting instructional approaches. The Partner Intervention Partner lesson plans provide the same Literacy Footprints framework used by the classroom teachers with some additional support for struggling readers. Each lesson is designed to engage students in literacy learning while they read books and write about their reading.